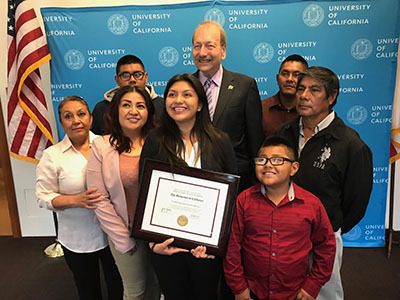 Valeria Jacqueline Alonso Blanco (Crown, psychology, ’18) with family members and UC Santa Cruz Chancellor George Blumenthal. Valeria Jacqueline Alonso Blanco (Crown, psychology, ’18) has worked hard to help first-generation and undocumented students overcome obstacles and transfer to UC Santa Cruz. Now the University of California is honoring her with a prestigious President’s Award for Outstanding Student Leadership, recognizing the impact of her advocacy and activism. The full impact of this good news didn’t kick in until she was invited to address the UC Board of Regents at a recent meeting, and saw the faces of her family members in the audience. “Knowing that they were very proud of me was what made this unforgettable,” she said. Blanco, affectionately known as “Jacque,” is being honored for helping to create a more diverse pipeline of college-bound students. On top of her course load at UC Santa Cruz, she has worked hard to help prepare first-generation and undocumented students to transfer to UC campuses. “Quite simply, Jacque’s work has improved, and will continue to improve, the educational experience of first-generation, undocumented, and Latinx students throughout all of UC,” UC Santa Cruz Chancellor George Blumenthal said at the Regents meeting. Blanco is deeply involved with the Cultivamos Excelencia Hispanic Serving Institution Initiative at UC Santa Cruz, developing and implementing a program that prepares SJCC students to transfer to UC Santa Cruz. She also provides academic and emotional support to migrant youth in Watsonville through her work with UC Santa Cruz’s Educational Partnership Center. In her work, she has drawn extensively on her own undergraduate research as well as her experience as a first-gen student and a child of immigrants. Drawing from her life, she came to understand the essential role that families play in students’ decisions to pursue higher education. After graduation, she plans to continue her work at Cultivamos Excelencia and the Culture and Achievement Collaborative. In the fall, she will apply to graduate school.